Beyond the amazing views, the Gateway Arch offers an abundance of things to see and do. Whether you have a few hours or a full day, you’ll find activities to please every member of your party. Click below for a sample itinerary and everything you need to know to plan your visit to the Gateway Arch. Schedule and pricing subject to change. Pricing varies based on date of visit. Pricing valid through 2019. Schedule and pricing subject to change. Each adult tram or documentary movie ticket includes a $3 National Park entrance fee. All federal recreation passes are honored. The park grounds are open from 5:00am–11:00pm year round. * Last tram leaves one-hour prior to closing. The Gateway Arch, Old Courthouse, and Call Center are open year-round but are closed on Thanksgiving, Christmas, and New Year’s Day. Summer Hours run the Saturday before Memorial Day through Labor Day weekend. Winter Hours run the Tuesday after Labor Day through the Friday before Memorial Day weekend. Passenger drop-off/pick-up available on 4th Street across from the Old Courthouse, between Market & Chestnut. Accessible metered parking available (first come, first served) on Memorial Drive between Walnut & Market Streets and Chestnut & Pine Streets. Find directions from any of St. Louis’ convenient highways and bridges. Find the most pedestrian-friendly routes. Skip driving and parking—take MetroLink, MetroBus, or the #99 Downtown Trolley to the Gateway Arch. Find important details for groups arriving by bus. The Gateway Arch has no on-site visitor parking available. But you’ll find a number of paid parking garages and surface lots near the Old Courthouse and Gateway Arch Visitor Center. The Riverboats at the Gateway Arch are located on the riverfront’s cobblestone levee, which offers convenient parking for a cash fee. Groups arriving by bus will appreciate our free bus parking along the south riverfront, available on a first-come, first-served basis. As one of America’s cherished national parks, the Gateway Arch takes your safety and security very seriously. Here are a few simple guidelines to ensure a safe experience for all visitors. Visitors entering the Gateway Arch facility are subject to search and screening by magnetometer and x-ray equipment, similar to airport security. Allow plenty of time to go through security screening. During our busier times the wait can be up to 30–45 minutes. Pack lightly for faster screening. These items are prohibited inside the security gates: pepper spray, mace, guns (including CCW), cat eyes, brass knuckles, and knives with non-folding blades or blades longer than 4”. The Gateway Arch is an experience enjoyed by people of all ages and abilities. Recent improvements have expanded access to even more of our attractions. With the exception of the Tram Ride to the Top of the Gateway Arch, the second and third decks of the riverboats, and the upper floors of the Old Courthouse, most facilities at the Gateway Arch are wheelchair accessible. See below for specific directions to our various attractions. Parking: While there is no on-site parking available, visitors can find a list of preferred parking locations at getaroundstlouis.com. Each garage and surface lot has handicap accessible spaces available on a first come, first served basis. Two passenger drop-off/pick-up spaces are available on 4th Street across from the Old Courthouse, between Market & Chestnut. Metered accessible spaces near the Arch entrance are also available on a first come, first served basis along Memorial Drive between Walnut & Market Streets and between Chestnut and Pine Streets. Tram Ride to the Top: The Tram Ride to the Top of the Gateway Arch is not fully accessible for guests with mobility impairments, as no wheelchairs, scooters or strollers are permitted on the Observation Deck. To reach the top and return, you must be able to manage at least 96 steps, divided into six flights, and you may need to stand for 30­–60 minutes. No seating or restrooms are located at the top of the Arch. New Museum at the Gateway Arch: The new Museum at the Gateway Arch was designed to prioritize universal design throughout the galleries to accommodate people of many different abilities and to make the experience better for everyone. Universal Design is the design and composition of an environment so that it can be accessed, understood and used to the greatest extent possible by all people regardless of their age, size or ability.The museum features hands-on, touchable exhibits; large print text cards; front access for wheelchairs; interactive computer simulations; and much more. Gateway Arch National Park Grounds: Motor vehicles are prohibited but electric-powered mobility assistance devices (e.g. electric scooters, wheelchairs, and Segways) for transporting persons with disabilities are permitted on park roadways and walkways. See here for more information. Guests may borrow a wheelchair by leaving a valid form of identification with a National Park Service ranger at the Information Desk inside the Gateway Arch or Old Courthouse. Hearing-impaired visitors may request assisted listening and captioning devices for the documentary movie from the Information Desk inside the Gateway Arch. Sight-impaired visitors may request audio description devices for the documentary movie from the Information Desk inside the Gateway Arch. Service animals (as defined by the US Department of Justice) are permitted at the Gateway Arch and the Riverboats at the Gateway Arch. Strollers are permitted everywhere except in the Arch trams and the Observation Deck at the top of the Gateway Arch. You may park strollers at the tram ride loading zones located below the Gateway Arch before taking your Tram Ride to the Top. Many families park strollers there, so you may want to label yours with your name and address. Visiting the Riverboats from the Arch grounds: New, sloping pathways now lead from the Arch grounds down to the riverfront. If driving by car, parking is available on the levee at 50 South Leonor K. Sullivan Blvd., St. Louis, MO 63102. 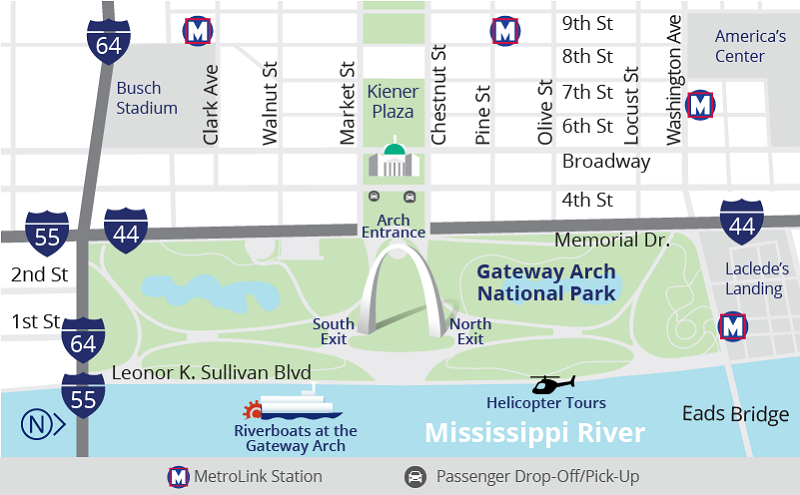 Visiting the Arch from the Riverboats: Enter the Arch grounds from the riverfront via the sloping pathways located to the north and south of the Grand Staircase. Another park entrance is available at the north end of the park near the Eads Bridge. Visiting the Arch from downtown St. Louis: Enter the park via the Walnut Street Bridge, located at Memorial Drive and Walnut near the Old Cathedral (209 Walnut Street, St. Louis, MO 63102) or through the north end of the park, through Laclede’s Landing using either the 1st or 2nd Street entrances. See our Pedestrian Map for details. **NOTE ABOUT RIVERFRONT ACCESS: Due the slope of the levee, the paved pathways on the cobblestones leading to the Riverboats at the Gateway Arch are not ADA compliant. For additional information or assistance, please email info@gatewayarch.com or contact our Call Center at 877-982-1410. To learn more about accessibility at the Arch grounds, visit the Gateway Arch National Park website. 630 feet, which is 63 stories, 192 meters, or 7,560 inches tall, making it the tallest man-made monument in the United States—taller than the Statue of Liberty, the Washington Monument, and even the Space Needle in Seattle. From the base of one leg to the other, the Arch is as wide as it is tall! Each leg of the Arch is 54 feet wide at the base, tapering to 17 feet wide where they meet at the top. How far can I see from the top? On a clear day, you can see up to 30 miles in either direction. View St. Louis and Missouri looking out the west windows. See the Mississippi River and Illinois to the east. How long does the Tram Ride to the Top take? The entire tour takes on average 45 minutes to an hour. First, your tour guide will lead you through an interactive multimedia experience prior to boarding the tram. Once on the tram, it is a 4 minute ride to the top and a 3 minute ride back down. However, when you get to the top observation deck you may stay as long as you would like. When you are ready to head back down to the lobby, just board the next tram as they run every 10 minutes. The structure was built as a monument to the vision of President Thomas Jefferson and to St. Louis’ role in the westward expansion of the United States. That’s why both the Arch and St. Louis are often referred to as “the Gateway to the West”. As of February 22nd, 2018, this National Park's name officially changed to Gateway Arch National Park. Why was it previously called the Jefferson National Expansion Memorial? It was built as a memorial to President Thomas Jefferson, who championed the Louisiana Purchase in 1803 and sent Lewis & Clark on their great expedition westward. The entire Jefferson National Expansion Memorial consists of the Gateway Arch and grounds (about 62 acres), plus another 30 acres encompassing the Old Courthouse, Luther Ely Smith Square, and many of the surrounding streets. What is the Gateway Arch made of? Steel and concrete. It has a double wall construction with ¼” stainless steel skin on the outside and 3/8” structural steel on the inside. The distance between the skin at the surface is 3 feet, narrowing to less than 1 foot at the top. There is a layer of concrete between the skins going approximately half way up the legs of the Gateway Arch. To support this massive, 43,226-ton structure, the foundations go about 60 feet into the ground. Finnish-American architect and designer Eero Saarinen won a national design competition in 1947, earning the privilege to design this timeless monument. Under normal conditions, the Gateway Arch does not sway, although it was designed to sway as much as 18 inches and can withstand an earthquake. It takes a 50-mile per hour wind to move the top just 1.5 inches either side of center. MacDonald Construction Company of St. Louis was the primary contractor on the project. A few hundred workers built the Gateway Arch with no loss of life, despite the danger involved in raising such a tall, unique structure. Why are the windows at the top so small? To install the last 4-foot section at the top, builders had to use over 500 tons of pressure to pry apart the north and south legs of the Arch. Larger windows could not withstand that pressure. At just 7”x27” in size, the 16 windows on each side of the observation deck may seem small. But the views they reveal are truly monumental. How long did it take to build the Gateway Arch? Construction began February 12, 1963. The final piece was put in place on October 28, 1965. The trams were not completed for over 2 years, with the north tram opening in July 1967 and the south tram in May 1968. How fast and how often do the tram capsules go up? The tram capsules rise at 340 feet per minute, or approximately 3.86 miles per hour. If both trams are running, 8 capsules with up to 5 passengers go up every 5 minutes. That means up to 480 passengers can ride to the top in an hour. Can guests take the stairs? There are 1,076 steps inside the Gateway Arch. And even if you wanted to climb them, you cannot. The steps are used for maintenance and emergency purposes only. How long can I stay at the top? Guests are welcome to stay in the observation platform as long as you like. However, note that there are no restroom facilities or food service at the top.